This is the official documantation for the `I`iwi pipeline version 2.0. Processing of the data using this pipeline was started in August 2010. To identify which version of `I`iwi was used for preprocessing, look for the keyword IIWIVER in the "Processing Pipeline" section of each FITS extension. That keyword was not put in for the beta version (< 1.0). Chances are the beta version was used if preprocessing was done before September 2007. The pipeline (`I`iwi - pronounced E-e-vee - a native hawaiian bird) preprocesses all the o.fits images and produces two sets of results: 1) the ????? ?p.fits images which are detrended (dark subtracted, flat fielded, etc) and are sky subtracted; 2) the ????? ?s.fits images which are detrended but NOT sky subtracted. This is intended so that PIs can use their own sky subtraction strategy without having to start from scratch. There is a subtle difference between PREprocessing and processing. CFHT preprocesses every single image but does NOT coadd them into a deeper stack. The stacking, so-called the processing, can be done on request by the TERAPIX team. The image processing steps needed to remove the instrument imprints are globally referred as the "detrending". In addition to the standard detrending steps usually taken (dark subtraction, flat fielding, etc), the WIRCam detectors (HAWAII-2RG) have specific imprints requiring special detrending recipes (R stands for Reference pixels, G for on-chip Guider - not the same beast as HAWAII-2 - a.k.a. WFCAM). For example, on some detectors, the guide window produces a structured cross extending all the way to the edges of the arrays. It is probably wise to familiarize yourself with how WIRCam images are generated before going any further. The raw images are stored as multi-extension FITS files. Each extension can be a single slice or a cube of up to 28 slices. If the keyword NAXIS3 exists, it is set to the number of slices. We prefer to use the CMPLTEXP keyword (non-standard, put by CFHT) which always exists and states the same information. The raw images are stored in 16-bit unsigned integers. This is also the output format of the processed images (p.fits and s.fits). The first step in `I`iwi is to convert 16-bit to 32-bit floats because all image processing steps are in floats. In converting to float, one must be carefull to use both the BZERO and CHIPBIAS (CFHT non-standard) extension keywords. All raw and processed WIRCam images have had an arbitrary constant value added to prevent 16-bit wrapping of negative numbers into high positive numbers when producing the CDS image (subtraction from two images). We call this constant the CHIPBIAS and we have settled its value to 7000, but it used to be 3000 earlier in the life of WIRCam (at least the first year). In addition, the very standard BZERO keyword is usually set at 32768. Important note. A constant CHIPBIAS of 7000 is arbitrarily added to all processed WIRCam images. On sky subtracted images, this means the background level is around 7000 adu. A very first step is to identify which pixels are likely to be saturated and keep a record of them so the finally preprocessed images can have them correctly flagged to 65535. We adopt thresholds of 24000 adu (for semesters 05B and 06A - which have a low electronic gain) and 36000 adu since semester 06B (the gain was changed in August 2006). These thresholds are not as definitive as those one would set for CCD images. This is simply because WIRCam images are CDS subtraction and, depending on the sky brightness (actually the sky rate) and detector readout time, the background in the first read may be at a higher or lower level than expected. Important note. An irreversible filter is applied to the data has it is being taken at the telescope. The RAW and REF reads that go into producing a CDS image are compared to a saturation map, in the acquisition system itself. Pixels in either of the two reads having values above the map are immediately flagged as saturated and assigned the value 65535 in the CDS image that is saved. Care was taken in producing that saturation map so it represents the values at approximately 95% full well. This has the advantage of limiting the number of stars affected by black holes at the core of bright saturated objects, easying the task of our automatic acquisition software that picks guide stars. Near IR detectors are notoriously non-linear in their flux response (typically 5% non-linear before saturation compared to less than 1% at saturation for CCDs). The non-linearity is intrinsic to the arrays (the charges accumulate in a capacitor-like device for which the capacitance is affected by the number of charges) as opposed to CCDs for which non-linearity comes from the non-perfect behavior of amplifiers. The problem of the non-linearity correction (NLC) is compounded by the fact that only CDS images are saved for WIRCam, not the two single reads (learn more about the image readout scheme). This means that an iterative approach is required to apply the NLC. 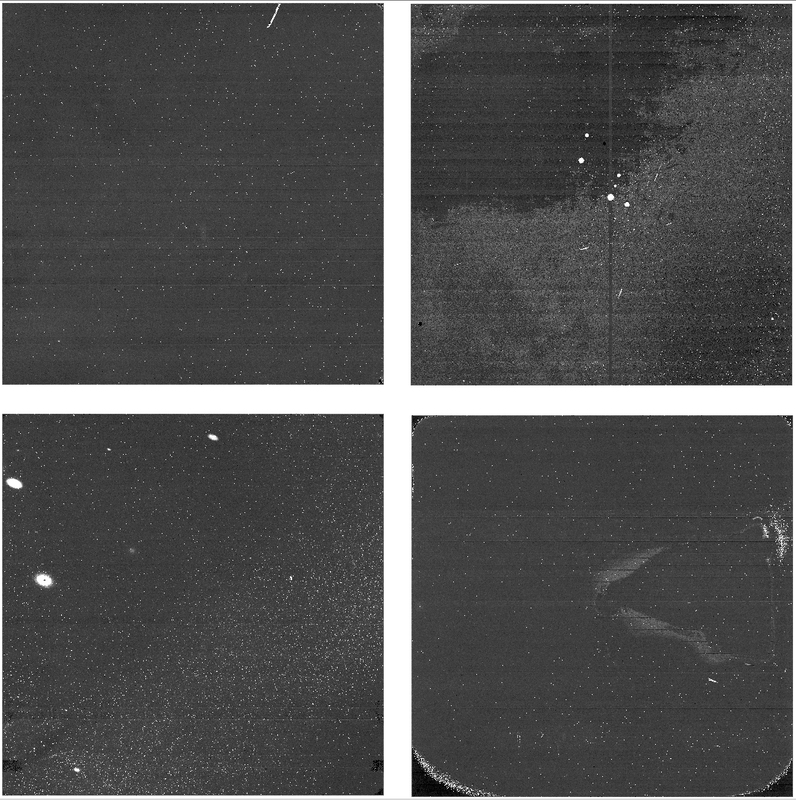 We used to characterize the non-linearity of each of the four arrays by observing the warm floor of the observatory when WIRCam is off the telescope and taking images of different exposure times (typically from 5 seconds to 90 seconds) to yield fluxes of 4000 ADU to 55000 ADU per pixel. We frequently (every 15 minutes for 7 minutes) took short exposures (5 to 7 seconds) to establish a baseline and make sure there was no intrinsic flux variation. For this calibration, we exceptionnally save both reads as well as the CDS image. That characterization started in August 2006. Here is an example of the WIRCam Non Linearity Curves. A better set of measurements was conducted in 2014 using a lamp with a well-regulated flux. The present results are based on this new set of measurements, of a much better quality than older ones. Tests have been conducted using engineering programs with Wei-Hao Wang, by observing an open cluster (Messier 67) to have a large range of star magnitudes covering the WIRCam field. The standard non-linearity correction (NLC) is a second-order polynomial in flux applied to the CDS (correlated double-sampling) image. This is part of the detrending process. The CDS image is the difference of two read-outs of the chips, one taken after 2.375 sec after the global reset of the chips, called the REF image, the other one taken at t + 2.375, called the RAW image. Unfortunately, these REF and RAW images are not saved, and only the CDS=RAW-REF is written to disk. An engineering mode (called DIM) exists to save the RAW and REF images, but it is not compatible with the queue mode of observations, nor with the staring mode generally used to get high precision photometry. The basic idea of not keeping the REF and RAW images was that REF does not contain much flux so that NLC can be applied to the CDS image directly. We have shown by our observations that this is not correct, and the best way would be to apply the NLC separately to the REF and RAW images BEFORE substracting them to get a correct linearized CDS image. However, Wei-Hao Wang has devised a mathematical treatment allowing to recover this correction even when starting from the non-linear CDS image. We have tested this method by taking images in DIM mode, and shown that indeed we could recover the result without having the original REF and RAW images. We then tested several NLC: the standard one where a median correction is applied to all pixels; a new one where each pixel has its own correction; and finally the mathematical method allowing an a posteriori correction applied to the CDS image, pixel by pixel. The four figures following show the results on 20 sec vs 3 sec of the M67 field. 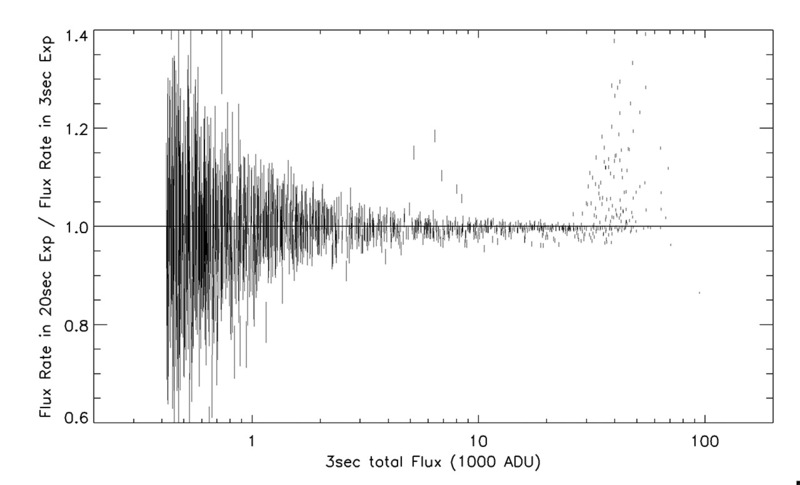 They compare the flux rate (ADU per sec) ratio between these two exposures vs the flux (ADU) in the 3 sec image. Would the detectors be linear, the ratio should be one. Clearly, no correction gives a ratio smaller than one, as expected. 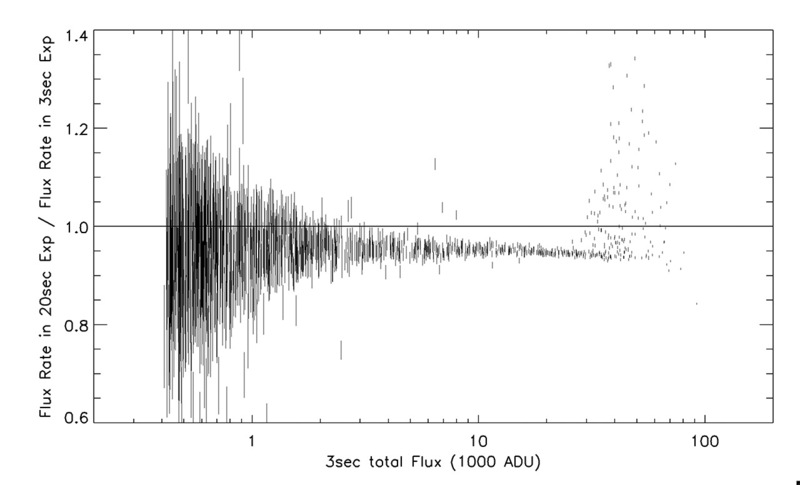 The cloud of points at high flux correspond to saturated stars, for which the ratio of fluxes does not follow the exposure times. The pixel-by-pixel correction surprisingly gives a similar result to the median correction, probably because the determination of this correction is noisier than the median correction, loosing the advantage of having separate corrections for each pixel. An intermediate correction could work better, if the NLC is correlated over large regions of the chips. Finally, the mathematical method used to recover a separate RAW and REF correction is the one which works best, and has been implemented into the standard I`iwi pipeline in October 2015. It must also be noted that the non-linearity of each chip differs: chip #60 (labeled 4) is the less non-linear, and we recommend its use for the staring mode observations of transiting objects. HAWAII-2RG detectors have an effective surface of 2040x2040 sensitive pixels. A 4-pixel wide border is used as reference to correct for relatively slow bias drifts, first seen during WIRCam commissionning as column to column DC offsets on a scale of several tens of columns. Here, it is assumed that each column is approximately constant and that any drift is seen as a level change between columns. In other words, we correct only the presence of vertical bands. Only the rows of 4 reference pixels on top and at the bottom of images are used, those on the left and on the right are not used. First, we correct the reference pixels themselves because a small DC level slope is seen from line 0 to line 3 and from line 2047 to line 2044 (most probably due to capacitive coupling effects). So, each of those 8 lines has its median subtracted from it. Then, we consider the 4 reference pixels on top and at the bottom of each column. We consider they follow any DC change that affects the whole column. The idea is to subtract the DC level seen on those 8 reference pixels from the 2040 data pixels of the corresponding column. We construct a 2048x8 matrix of reference pixels that we median along the vertical axis to obtain a 2048x1 reference line (that median of 8 reference pixels is to reduce noise in the measurement). Then, to further reduce noise and spurious effects, we smooth the 2048x1 line with a boxchar of 9. Then we subtract the corresponding scalar value for each data column (e.g. column 5 = column 5 minus 5th index of reference line). ;Try to correct the small slope seen in the reference pixels themselves, i.e. ;Now, for each column, use the median of the 8 reference pixels available. ;Crunch 8 lines into 1. This is a vector of 2048 reference columns. The dark current of the WIRCam detectors is generally low (less than 1 e-/sec). The cryostat is regulated to within one thousandth of a degree at about 80 K. So the dark current is thought to be very stable and varies linearly with integration time (figure ?). Instead of using up one filter position to have an aluminum blank for dark acquisition, we simply cross two science filters of different bandpasses (one in each of the two filter wheels), for example LowOH1 and H2. This has proven to yield exactly the same dark level as a pure blank. Caption: Each of these master darks is a median combination of a minimum of 15 single raw darks. They were obtained in the hour following the end of a science night. A background component slowly increasing with exposure time at rates of less than 1 e-/sec. Hot pixels (10-1000 e-/sec), especially at corner boundaries and on the right of the bottom right array. We have seen hot pixels changing position by a few pixels between thermal cycles. Warm "blobs" (less than 100 e-/sec) of about 100-1000 pixels, for example on the left of the lower-left array. Persistence effects due to stars or night sky emission observed during the night. 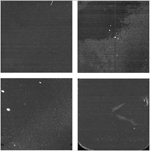 It is seen as fainter "blobs" or patchy background on long 630 sec darks only for the lower-right and upper-left arrays. In `I`iwi, dark subtraction is done for each slice by choosing the closest (in time) processed dark cube of the same exposure time. All except the persistence effects subtract well when a dark of the correct exposure time is chosen. A processed dark cube consists in a median of generally 15 darks taken sequentially (usually only 7 for 240sec or longer exposure times). Prior to doing the median of 15 images, each raw image is corrected for the common noise pattern (that's an electronic noise pattern common to all the 32 amplifiers -- because pixels are read in parallel -- and is constructed by the same method as that to construct the median amplifier for the crosstalk correction). A note on master darks. In the future, we plan on constructing a master dark valid for each run, one for each exposure time. Starting with semester 07B, we are systematically taking darks every morning (darks were taken manually and not as frequently before that). If available, twilight flats are used to process the data. The twilight flats are collected by the observers at the beginning and end of the night. Twilight flat sequences have to be validated in order to be used in the pipeline. If no twilight flats are available, we are using dome flats obtained at the beginning of each observing run on the observatory dome illuminated with a tungsten lamp. We obtain a cube of 15 raw flats with the dome light turned on and subtract the 15 raw flats of the same exposure time with the light turned off. This ensures any instrumental thermal component is removed. We typically use 5-6 second exposure times for wide band filters and up to 30 second exposure times for narrow band filters and target fluxes of about 10000 adu on lamp-on flats. Flat fields show mostly a radially increasing flux level and, fortunately, no high spatial frequency fringes. The pixel to pixel quantum efficieciency variations are of the order of a few percents. A very important note on flats and photometry. The `I`iwi convention is to treat each detector entirely separately. This means that the flat fielding step does NOT remove detector to detector quantum efficiency differences. The median background value of the processed dome flat is 1 for each of it's four detectors. 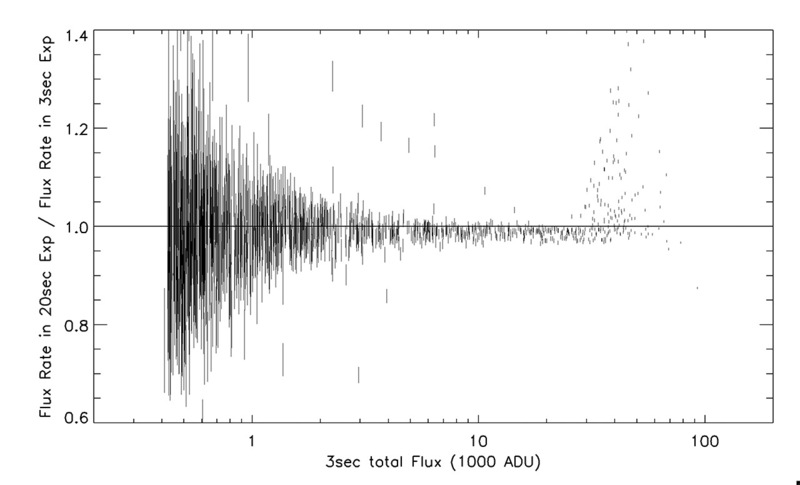 In other words, the same star observed with the four detectors will yield different flux measurements. The relative quantum efficiency differences are instead being absorbed in the quoted zero-point found in each extension header of the processed images (s.fits and p.fits). More details in the photometry section. This convention has the advantages of 1) not changing the electronic gain values and therefore the relative photon statistics, 2) ***there were more fundamental reasons I forget. An other important note on illumination correction. No illumination correction is made in 'I`iwi. The change of pixel scale is small (less than 1% in the corners) and the photometry error that it introduces is much smaller than the current absolute photometry uncertainty (of 4-5%). Preliminary photometric measurements using twilight instead of dome flat fields indicate that dome and twilight flat fields are consistent to within 0.5-1.0%. Nevertheless, twilight flat fields are obtained on a regular basis and will probably be used in the next version of `I`iwi. `I`iwi uses the bad pixel mask constructed by Chi-Hung Yan (Academia Sinica - Institute of Astronomy and Astrophysics - ASIAA). He developped a method to construct bad pixel masks from darks and dome flats aided with a ds9 interface to do a second pass manual inspection - see Chi-Hung's method. The bad pixel mask has 1 for good pixels and the float Not-a-Number (NaN) value for bad pixels. 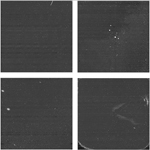 On-chip guiding unfortunately has side effects on the science images. These artifacts depend on the DSP code used in clocking the science and guide pixels and a lot of effort was spent to optimize the code and minimize the unwanted artifacts. This means the side effects description and the detectors afflicted have changed between observing runs, even within a run. That complicates their removal during post processing. The guide window size has changed over the life of the instrument and, unfortunately, the corresponding header keywords have not always been correctly populated. Note. A guide window is always read out but put in a predefined bad pixel region for unguided science exposures. Science calibration images like darks and flats are always obtained with the guide window clocked in order to always be in the same hardware setup. 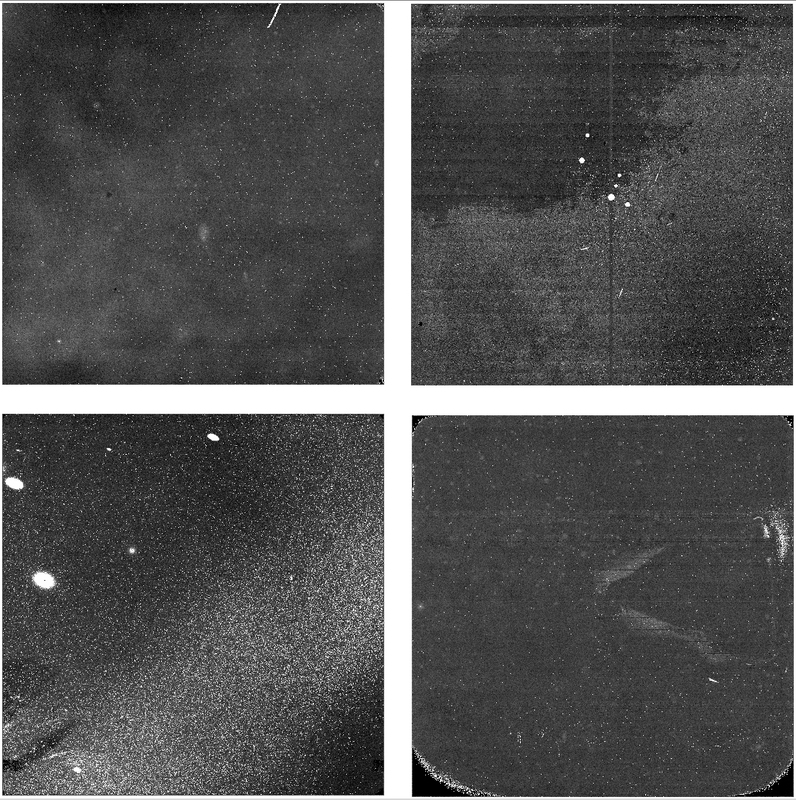 Sky construction requires the use of at least 3 (ideally 5) adjacent observations taken through the same filter at different dither positions. The detrended images are usually normalized to 1, sources are masked and a median is taken for each pixel. 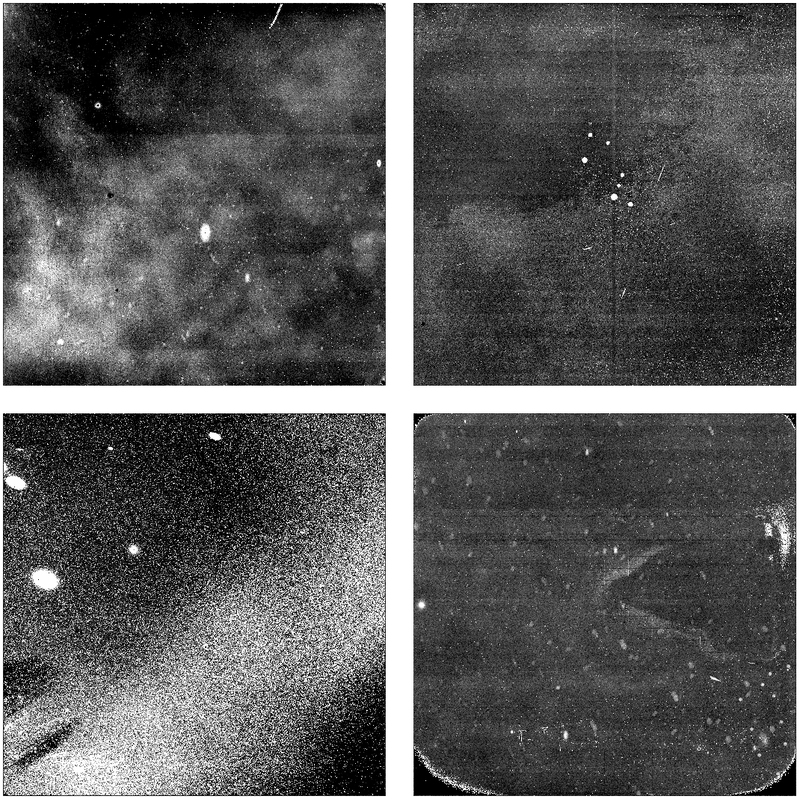 Best sky subtraction results are obtained when using images obtained close in time and space. So, for each image, a different set of neighboring images needs to be selected. If not enough sky images are available, a default sky is used. The sky background level is estimated on detrended images by using a simple median on each detector. To normalize the mosaic to a flux of 1, the relative quantum efficiency of each detector is taken into account. The wings of stellar sources (under the 1.5 sigma threshold) can bias the sky construction and produce dark rings after sky subtraction. To prevent this, the idea is to enlarge each masked star to make sure no wing signal creeps in. The fastest way to do this is to apply smoothing using a box of 5x5 (the smooth command in IDL). Images taken after March 2008 do not show signs of cross-talk so this step was removed from the pipeline. However, there were reports of signs of residual cross-talk on deep stacks. We are working on a solution to this problem. For images taken before March 2008, WIRCam was affected by three types of cross-talks. We liberally named them, the "Negative", "Positive" and "Edge" cross-talks. Here are detailed information and examples on the cross-talk effects. Nothing is done to remove this cross-talk. It is confined to the 8 amplifiers of an affected viedo board. This is the most important source of cross-talk. We basically subtract a median amp from each of the amplifiers. The median amp is constructed by slicing all 32 amps from a detector to create a cube of 2048x64x32 pixels (from an image where sources are masked) then simply taking the median. The edge cross-talk is suppressed during the medamp subtraction that removes the negative cross-talk. No need for further subtraction. The goal of the astrometry solution at CFHT is to be within an error of about 1 arc second and this goal is almost always achieved. For the sake of simplicity, of robustness and because there was no FITS standard to express non-linear terms, the `I`iwi WCS solution is purely linear (assumes a constant scale). The following figure shows that WIRCam has a field distortion of about 1% in the corner of the mosaic. Knowing the geometry of the detectors, a first fit using all 2MASS stars found on the whole mosaic is performed. Then, provided enough stars are found, the WCS of each detector is refined individually. The RMS scatter of the resulting WCS solution is generally about 0.3-0.8 arc second. The full mosaic approach makes use of the known geometry as determined by the Terapix team who produced a wircam.ahead file. `I`iwi uses this geometry to project into sky coordinates (expressed in degrees with the field center being at 0,0) the sources found by Sextractor. 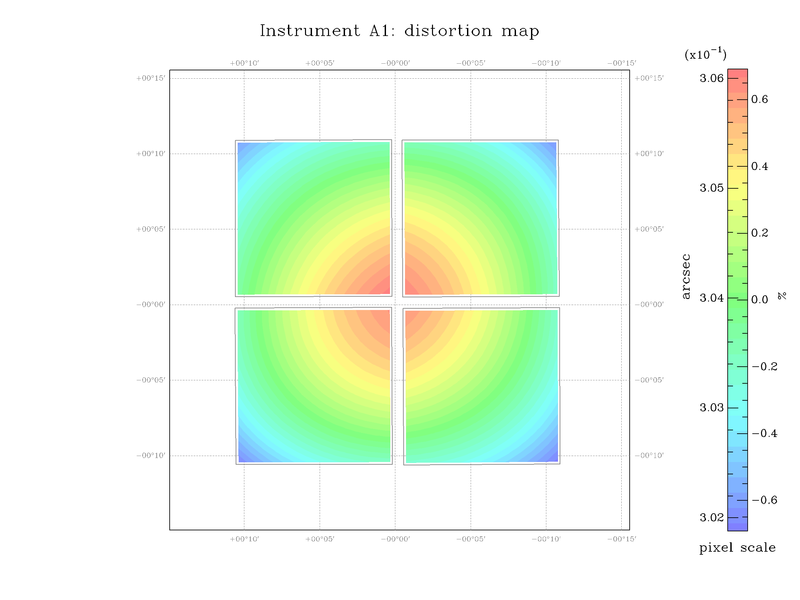 It fits a rotation as well as d_alpha, d_delta offsets. It then matches stars to the 2MASS catalogue. This method is robust (even for sparse fields) because it uses all sources found on the mosaic. But the detector geometry is not exact and it is not rare to see larger than 2-3 arc second discrepancies for stars in the corners of arrays. Starting with the list of matched stars obtained in the full mosaic solution, this method operates on individual detectors to refine the WCS solution. `I`iwi calls the IMWCS software in the WCSTools package (D. Mink, Harvard). This generally yields a better than 0.5 arc second rms solution. In rare cases, only the full mosaic solution converges and is kept. To know which method was used for each extension of the FITS file, look at the WCS_ORIG keyword in the "Processing Pipeline" section. IMWCS-linear means that the detector by detector refinement method using IMWCS worked and was kept. The quality of the fit is given in MATCHRMS, the number of stars used to initiate the fit is WCSNREF and the number of stars kept in the fit is WCSMATCH. If WCS_ORIG='MOSAIC-linear' then only the full mosaic solution could converge in which case MATCHRMS, WCSMATCH, WCSNREF and more keywords are missing. 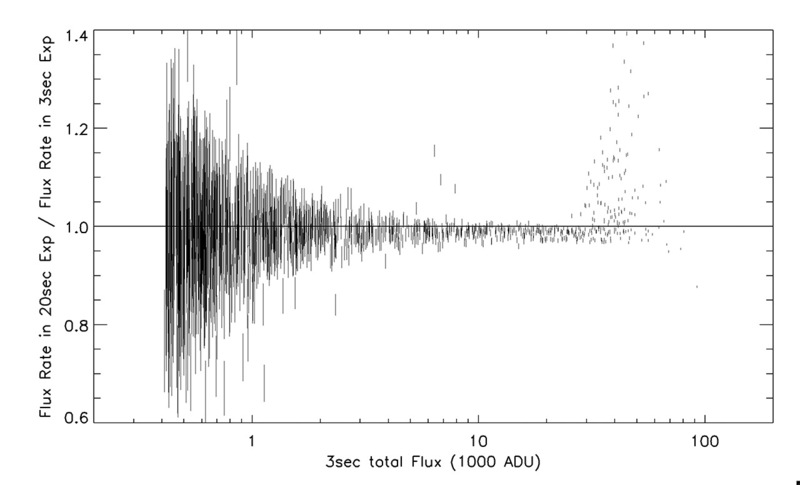 The star flux is obtained using SExtractor and the FLUX_BEST is used. Arguably, this is NOT the best output photometry to use but for other reasons (an unidentified bug in SExtractor when using weight maps and thresholds different than 0) it was used rather than FLUX_AUTO (which IS probably better). No aperture correction is done on the pipeline side. We use the Sextractor values directly. and the zero point thus measured is stored as PHOT_C0 in each FITS extension header of the s.fits and p.fits files. This WIRCam Zero Points page details the values used in the pipeline with curves for each filter and the adopted zero point offsets between detectors. and simply take the median of all stars (bright and faint - a weighted average would be more appropriate indeed for `I`iwi version 2). The zero point thus measured is stored as FOTC_?? in each FITS extension header of the s.fits and p.fits files (?? represents the slice number in the cube). No color term is yet included in the pipeline. A very important note about how the different detector sensitivities is handled in `I`iwi. There are two possible conventions: 1) Normalize the flux of each individual detector to a common-to-all-detectors zero point, generally done after flat fielding ; 2) Make no normalization and simply have different zero points for each detector but write the zero point in the FITS extension header. The second convention is adopted for `I`iwi. This means that on the finally preprocessed images, stars of the same magnitude placed on the four arrays will have different flux counts. The zero point is found in each FITS extension under keyword PHOT_C0 (as determined from standard stars) or keyword FOTC_?? (as determined from 2MASS stars in the field, ?? represents the slice in the cube starting with 01). The main reason for doing so with WIRCam is to preserve key hardware constants like electronic gain and saturation values which would be changed if we were to normalize all detectors to a common zero point. Note for Megacam users, the other convention is use for Megacam. Elixir normalizes all the detectors to a common zero point. For stacking purposes, one therefore needs to scale the flux of each detector appropriately. With Scamp (from E. Bertin) one needs to have the argument MAGZERO_KEY set to PHOT_C0 or FOTC_?? and use a post May 2007 version of scamp (a bug - that argument was not handled properly before). The WIRCam FITS files are multi extension files (MEF) with a primary header and 4 extension headers. `I`iwi updates and edits the extension headers but not much is done with the primary header as processing is mostly on a per detector basis. SLDATE?? is the exact date when each of the image slices was obtained. It corresponds to the start of the reset. These keywords were added on October 26 2007. Since October 2 2007, DATE represents the moment at the start of the reset of a CDS image. Before that date, it corresponded to the time at the end of the exposure. EXTNAME is the extension name and actually represents the part number for each of the four HAWAII-2RG detectors. QEPOINTS is the only information provided by the detector manufacturer. It gives the quantum efficiency in two broadband filters: J and K. These values should not be taken at face values, they are probably affected by 10-15% errors (the maps showed a wing of pixels with QE higher than 100%!). See the WIRCam Throughput web page for more details. LIN1PCT, LIN3PCT and LIN5PCT were meant to represent the adu level at which the detectors are non linear by 1, 3 and 5 %. One should rather see the WIRCam Non Linearity web page to obtain more relevant information. MDCOORDS is 1 or 4 and represents the number of images that are part of a micro dithering pattern. MDCOORDSis 1 when no micro dithering is used and MDCOORDS is 4 when it is, in which case MDCOORD? take the x,y offsets applied to the tip-tilt plate to effectively dither by half pixels. MDREPEAT represents the number of loops of micro dithering done for this cube. CMPLTEXP is a usefull keyword that states how many slices were successfully acquired for this cube. It exists in case of problems in the image creation and because NAXIS3 (if it exists) does not otherwise discrimintae against bad slices. It should generally match the number of expected slices, NEXP, unless a problem happened during observation or cube generation. CHIPBIAS is an arbitrary constant value added to the adu values in order to be able to save in 16-bit integer format without having the negative values wrapping during the CDS construction. EXPTIME is the accurate exposure time as determined by the DSP code that controls the readout scheme. It is precise to at least the millisecond. There is no shutter in this instrument and the exposure time is determined by the time period between the first and second reads of the CDS. OPENTIME is the period of time during which photons could accumulate on the arrays, i.e. the time elpased between reset and the last read. WCBLANK describes whether any form of on-chip guiding reset was done during the full science image reset or readout. This keyword was added somewhat late in the life of the instrument when it was realized that on-chip guiding during science reset/read introduces artifacts in the science images. 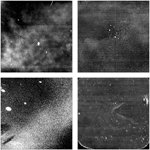 SCFOWLER describes whether any Fowler sampling is done in constructing the image. By default, most filters use SCFOWLER=1. For the LowOH filters, SCFOWLER=4. TRGTYPE can be "TARGET" or "SKY". It is meant as a keyword to know whether an image can be used to build a sky frame in the nodding observing mode. In the case of normal Dithering Pattern (DP) or Wide Dithering Pattern (WDP) mode, this keyword should always be "TARGET". All the guider keywords in this section are legacy keywords from other instruments and should be ignored entirely. There is no separate guider for WIRCam, only on-chip guiding, and it is the subject of the WIRCam Guider section. INSTZRA and INSTZDEC are the instrument off-axis offsets applied to the target when sending coordinates to the telescope so that the presumed target be positionned off the mosaic center (out of the gaps) and in the corners of the North-East detector. Most of the keywords in this section are self explanatory. Note however that before September 2006, they were prone to errors and will often be misleading. WCCLOCK1,2,3,4 are meant to tell whether on-chip guiding pixels were being clocked or not. 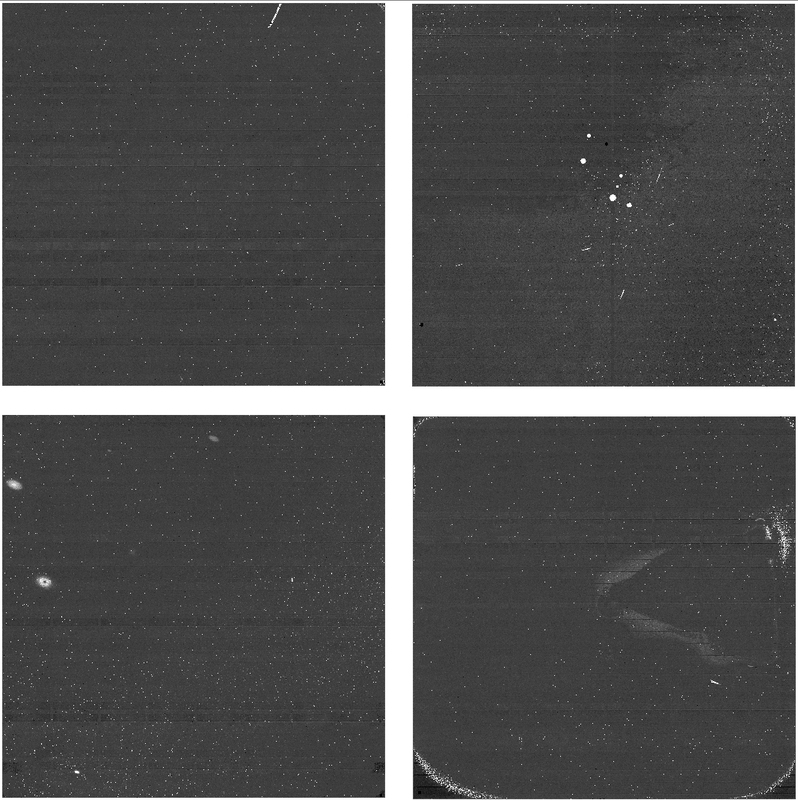 When clocked, guide pixels introduce artifacts on the science images which requires a different set of calibration than when no clocking occurs. Since late 2006, pixels are always clocked but placed in predetermined positions in the case where guiding is not requested. WCONOFF1,2,3,4 are meant to tell whether on-chip guding is enabled or not. If guiding is not requested then these keywords are set to 0 even if (since 2006) pixels are being clocked anyway. WCONOFF1,2,3,4 is basically a way to kwow if meaningfull values are to be expected in all other WC?????? keywords. WCNULL?? are the target centroid position for each guide star. They take values between -0.5 and +0.5 pixels and exist to compensate for the inability of positionning a guide window to a sub integer pixel value. This section is populated by the acquisition software which takes a snapshot image after telescope slewing to control the exact positionning of the field center and to choose guide stars automatically. Note that the value of WCGDDEC1,2,3,4 was incorrect before February 29 2008. The values were incorrecly divided by 15 before being converted to HH:MM:SS. WCAQPTST states whether exact field centering was requested and applied or not. If so, the centering is then precise to within an arc second. Most are self explanatory keywords of various measurements of environment, telescope and instrument temperatures. WCFOCTMP is the closest measurement to the detector temperature. CRUNID describes the instrument installation ID. It usually follows the QRUNID keyword except if, for example, unmounting and remounting the instrument during an observing run was performed. As of March 25 2008, it never happened for WIRCam. This is to let the pipeline know that it should be using different sets of calibrations (presumably because illumination and rotation may have changed in the process).